Entity disambiguation is the task of mapping ambiguous terms in natural-language text to its entities in a knowledge base. It finds its application in the extraction of structured data in RDF (Resource Description Framework) from textual documents, but equally so in facilitating artificial intelligence applications, such as Semantic Search, Reasoning and Question & Answering. 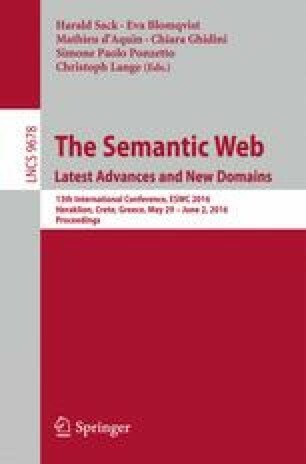 In this work, we propose DoSeR (Disambiguation of Semantic Resources), a (named) entity disambiguation framework that is knowledge-base-agnostic in terms of RDF (e.g. DBpedia) and entity-annotated document knowledge bases (e.g. Wikipedia). Initially, our framework automatically generates semantic entity embeddings given one or multiple knowledge bases. In the following, DoSeR accepts documents with a given set of surface forms as input and collectively links them to an entity in a knowledge base with a graph-based approach. We evaluate DoSeR on seven different data sets against publicly available, state-of-the-art (named) entity disambiguation frameworks. Our approach outperforms the state-of-the-art approaches that make use of RDF knowledge bases and/or entity-annotated document knowledge bases by up to 10 % F1 measure. The presented work was developed within the EEXCESS project funded by the European Union Seventh Framework Programme FP7/2007–2013 under grant agreement number 600601.